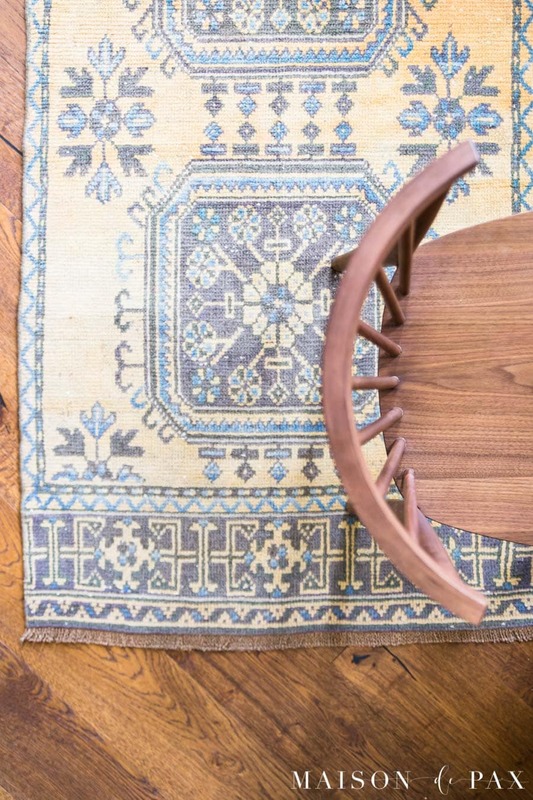 Vintage Persian and Turkish rugs are becoming increasingly popular in modern homes… Find out everything you need to know before shopping for vintage rugs for your own space! “I’ll never be like my parents about…” Famous last words, right? Sure enough, when it comes to certain parenting phrases, backsplash tile, and area rugs, I have again proven my younger self wrong. I grew up in a house with pretty traditional rugs. My parents’ living room still has an enormous red, blue, pink, and green Persian rug that had belonged to my grandparents… And I confess that when I began decorating my own spaces, I wanted to go more neutral, feeling that it was more modern or something. But these past few years I’ve found myself being drawn back to those traditional rugs with bolder colors and floral or geometric designs. And while there are some lovely reproductions out there these days, you simply can’t beat the quality and character of a hand knotted vintage wool rug. 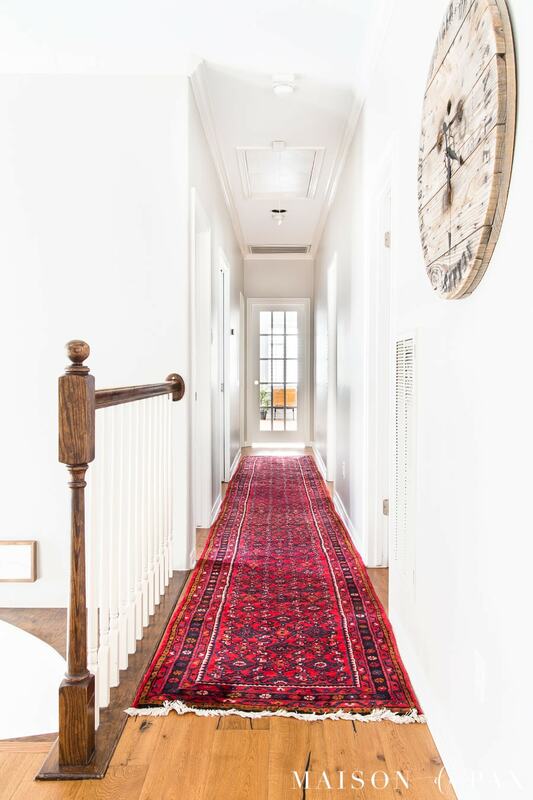 You can also find unique sizes (like our 22′ long hallway runner) that are uncommon in modern, manufactured rugs. 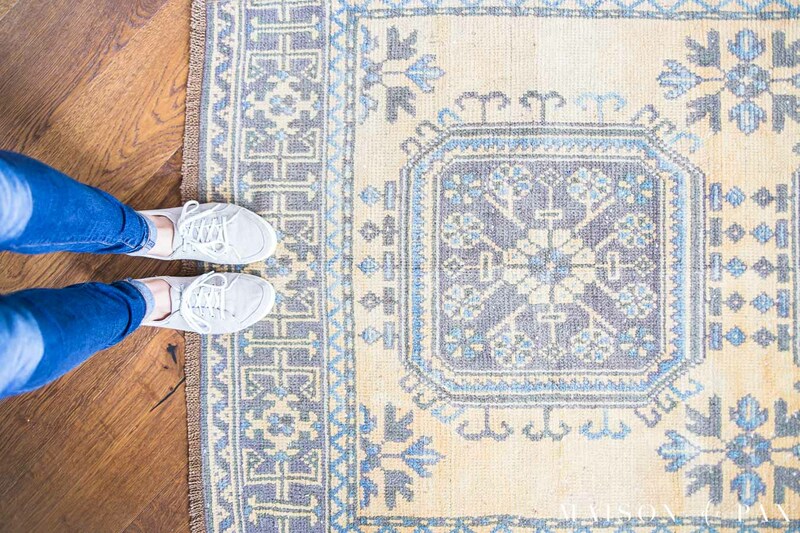 And since I’ve recently received a slew of questions after posting a new rug buy on Instagram, I thought it might be time for a little vintage rugs 101. I promise a post very soon about where to buy vintage rugs (and where to buy them affordably! ), but first I think it helps to know some basic terminology. 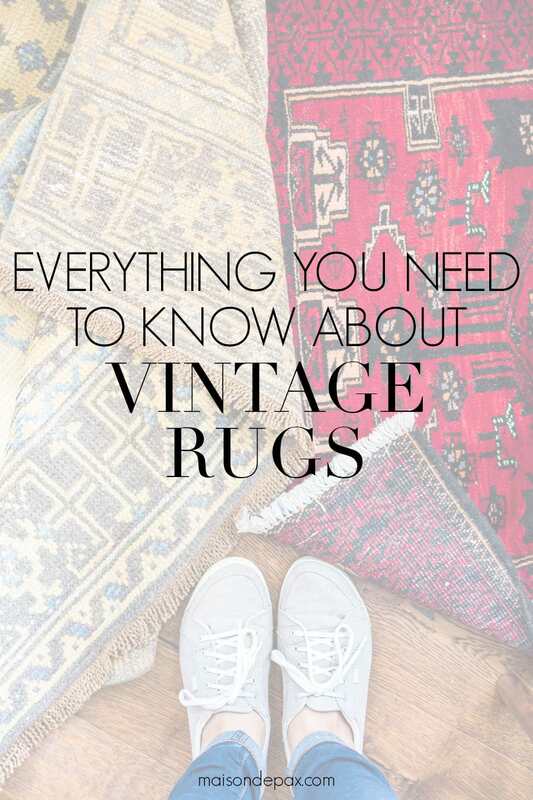 Disclosure: I am not an antique rug expert… I’m just a bit of a hobbyist who has gathered enough information to feel like I know what I’m doing enough to shop vintage rugs for my home. 😉 So I gathered the various FAQ’s I’ve received from readers and I hope this post helps you feel confident enough to try it yourself! FAQ: What makes a rug “vintage”? First of all, while the terms “vintage” and “antique” are often used interchangeably on sites like Craigslist, among rug collectors, “vintage” usually refers to something 25-100 years old, while “antique” refers to items more than 100 years old. Though, as I mentioned, some sites and sellers will use these terms interchangeably. Personally, I’ve found anything from 1940-1970’s seems a sweet spot of price and quality. Another useful term when searching for vintage rugs is the question of whether or not rugs are cropped or shaved. It has become popular for vintage rug refurbishing to include shaving the top layer of the pile off, revealing the weave of the rug more vividly (by removing the worn, aged wool) but also making the rug a bit thinner and less plush. I have some of both (see the difference below: the top rug was cropped, while the bottom still has its thicker pile… we are an equal opportunity vintage rug household 😉 ), but just be aware of the difference when you are shopping for vintage rugs. FAQ: How do you know what to look for in quality and price of vintage rugs? True vintage hand knotted rugs never have a backing like modern rugs do. That is why you will often see in the listings for sale an image that shows the back of the rug as you see above. True hand knotted rugs have fringe coming right out of the rug’s weave (not sewn on separately). Authentic vintage hand knotted rugs never have polyester, plastic, or any other man-made material. Instead, they are also made entirely of natural materials, usually wool. Some will have cotton for the foundation and a few rare ones are entirely cotton; there are silk ones, too, but my experience and this post is really limited to wool. Hand tufted rugs are made by punching threads through a fabric sheet (often with a device called a “tufting gun”) and then adding another layer of fabric/backing to hold the tufts in place. While hand tufted can be a great, more affordable option for rug construction (and, admittedly, I even have some in my house), this is not the kind of “vintage rug” you are looking for if you want the look we are discussing in this post. Hand knotted, on the other hand, refers to traditional, ancient methods: the “foundation” threads (which become the fringe on the final piece) are stretched across a loom and intricate designs are woven by hand through the foundation. KPI (knots per inch) of hand knotted rugs usually range from ~50-400 (and actually even higher on very expensive rugs). The higher the density, the higher the quality and price. Most of the ones I have purchased fall at or near 100 KPI; for our home and budget that has proved a good balance of price and quality. Personally, I have opted for rugs where the sellers have not specified whether the wool is hand spun or naturally dyed, but given the prices I’m guessing they were not. For me (with a house full of young kiddos) having rugs that are good quality but not super valuable provides peace of mind. Authentic, vintage, hand knotted rugs are not all truly “Persian rugs.” There are also rugs made in other countries (I’ve seen lots lately coming out of Afghanistan, for example), and while not true “Persian” or “Turkish” rugs, many still are made with the same traditional methods. Colors and designs of traditionally woven rugs depend upon the styles and available dyes in a particular area. As you begin searching, you’ll find a variety of terms, including several that refer to the areas or towns in which the rugs are made, and you’ll begin to figure out which ones are your favorite. True Persian rugs are made in modern-day Iran. Persian rugs are generally hand woven with short to medium pile (so the wool tufts up, rather than being woven flat) and colorful geometric and floral designs. 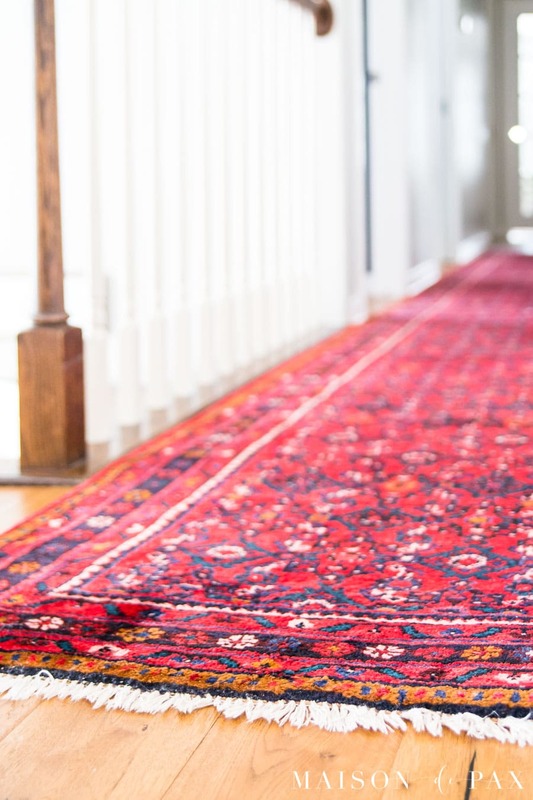 The deep reds and other jewel tones are typical of vintage Persian rugs, though you can find a variety of other colors, as well. One popular style of rug is known as Heriz (named for a region in northwest Iran) that has bold, geometric patterns often with a medallion in the center. Turkish rugs have two general categories. Some are very similar to Persians in their styles and design, while others – known as kilims – are flat woven rugs, usually exclusively in geometric designs. I have to say that after a few years of searching for vintage rugs, I’ve decided that Turkish rugs with a decidedly Persian flair are probably my favorite. I particularly love Anatolian rugs (named for Anatolia, a particular region of Turkey) or Oushak rugs (named for one of the larger towns in Anatolia), which are Turkish rugs that have fair amount of Persian influence in their designs and patterns, though they tend to have more pinks and oranges and often slightly more muted tones than the true Persians. Picking out those particular terms helps significantly when I am searching for rugs I want, something that is super helpful when shopping for vintage rugs. 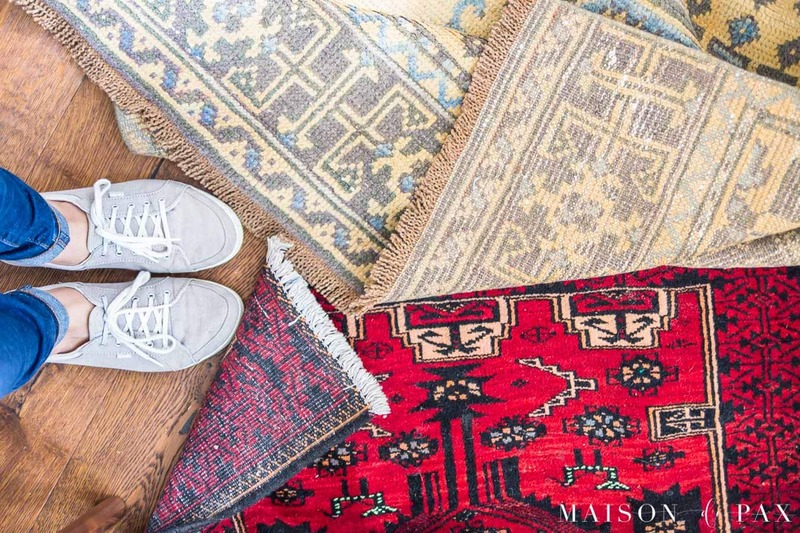 FAQ: How do you clean and care for vintage rugs? One of the beauties of choosing a rug that is already 40-80 years old is that you know it has proven its ability to withstand the test of time. I personally love to imagine the history that it possesses. Naturally, though, the actual dirt from others I’m happy to do without. 😉 So when you begin shopping for vintage rugs, you’ll want to find a seller who cleans their rugs before selling. Almost all sellers will specify if and how the rug has been cleaned. 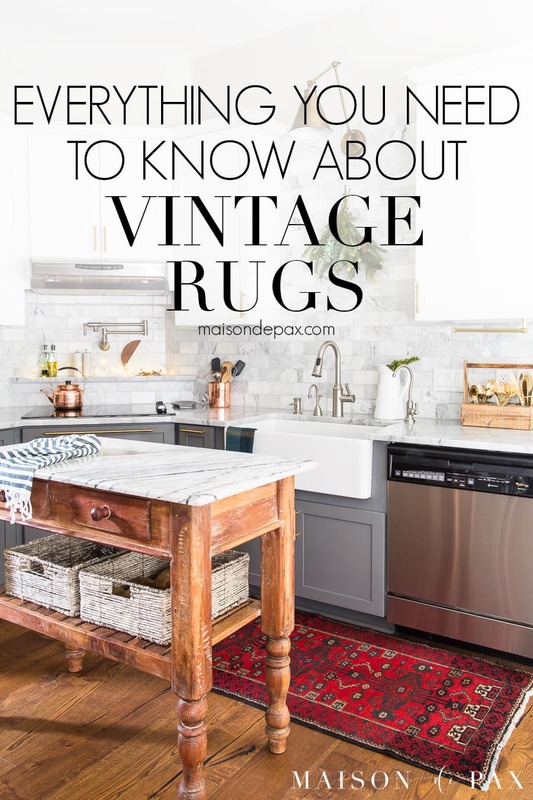 I often get questions when I mention my vintage rug in my kitchen from readers who are concerned about using a vintage rug in such a high traffic (and sometimes messy) area. Honestly, I couldn’t think of a better rug for that spot! It’s 100% wool, and I like to remember that the sheep always survive outside in the rain. 😉 Seriously, it does fine when we accidentally drip on it, and it has protected the wood floors beneath it beautifully. If I ever do actually drop macaroni and cheese or some other messy food on it, I just use a damp kitchen rag to clean it. At worst, I’ve used a squirt or two of Resolve rug cleaner. Otherwise, a shake, a sweep, a quick vacuum… all of those work for basic cleaning and maintenance. I hope this helps you feel more confident about trying a vintage rug in your own home! Be sure to come back to find out where to buy affordable vintage rugs for your space. And don’t forget to pin it! Great article! I’ve never thought of vintage rugs for my house but I see now that’s its because I was just ignorant of what to look for. Thanks for the enlightenment! I am SO glad you found this helpful, Angela!! What do you use as a rug pad to keep your rugs in place? Great question! I actually don’t. The long hallway runner fits the width of the hall almost exactly, so it doesn’t really slide unless I pull hard on one end. The rug by the sink does slide around, but it doesn’t bother me. The rest have furniture sitting on them at the moment. Wonderful information. Thanks for taking the time to educate the rest of us. I’ve been learning a great deal, about vintage Persian rugs, recently, as well. My son has become a rug dealer through a friend who is from a family of Persian rug dealers going back to the 1500’s. Most of the rugs are from the 1930s to the 1960s. Persian rugs are pretty reasonable right now but, because of the ban on any imports of Iranian made goods, what is here in the US is what is here. In fact, the ban has raised the prices in Iran due to the loss of the American market. I won’t presume to put their business here, but email me if you would like the info. Thank you, i have been looking, but there were too many things to consider that i knew nothing about. This will certainly help my search, i have a couple that my parents had that says made in Iran and they are about 30 yrs. old now and are still so beautiful. How wonderful! They do keep such beauty with age, don’t they? Not all hand tufted rugs are gun tufted, hand tufted rugs can be individually tufted (one tuft at a time) and a secondary backing put on to encapsulate the ends of the tufts. There is nothing wrong with hand tufted rugs and they can be as beautiful as a hand knotted rug at a fraction of the price. Hand tufted would fall into a category of disposable fashion where people do not want to pay an extravagant price for a rug they may change out in 5 to 7 years. 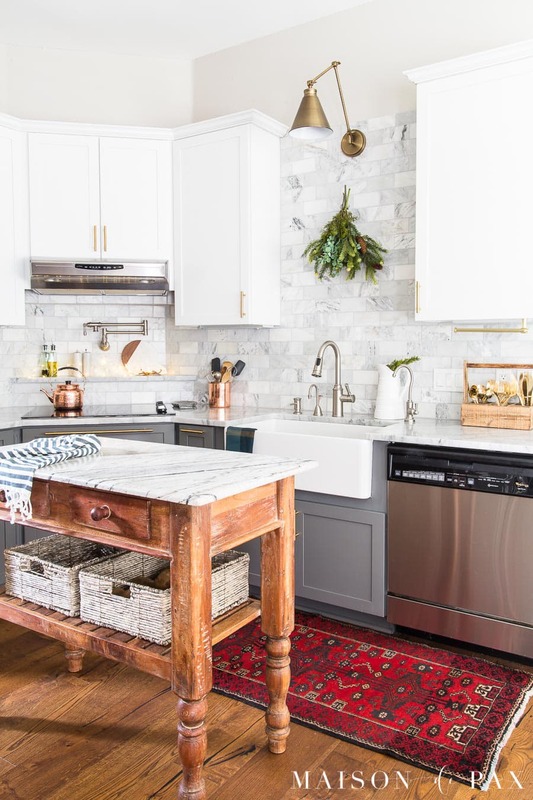 You would not put an expensive hand knotted rug in front of a sink, it could get destroyed. Great distinction! Price is always a consideration, and there are many products which are great options when 5-7 years is the expected investment. Thank you for your ” vintage rug 101″. More and more young people are buying vintage and antique Persian and Turkish ( and Caucasian) rugs. They are beautiful, unique ( no 2 alike) and sensible. They clean easily and most actually look better with age. As a collector and shop owner, I applaud your introduction to vintage rugs. Polypropylene rugs will end up in a landfill ( and never break down) but a handknotted rug can last for generations. I suggest to people buying their first rug to buy what you like. You can always look in an expensive rug shop to get an idea of styles and colors. Then start looking at thrift stores, online, consignment shops. The advantage of buying from a store ( online or brick) is you can ask questions. Is this handknotted? I find browsing boutiques or Etsy a great way to see what you like. Etsy, unfortunately has limited Persian rugs because of Trumps sanctions on Iran. Although some vendors have links to their own shop where you may find a beautiful vintage rug. Thanks, Geoffrey! Those are all great tips for finding and shopping for vintage rugs. I’ve been learning a great deal, about vintage Persian rugs, recently, as well. My son has become a rug dealer through a friend who is from a family of Persian rug dealers going back to the 1500’s. Most of the rugs are from the 1930s to the 1960s. Persian rugs are pretty reasonable right now but, because of the ban on any imports of Iranian made goods, what is here in the US is what is here. In fact, the ban has raised the prices in Iran due to the loss of the American market. I won’t presume to put their business here, but email me if you would like the info. They are on Etsy as well as a store and everything was legally imported before the ban. SO helpful and an interesting history behind Persian rugs! Thanks for the post! I have just started to purchase a few of these myself. While they are more expensive, I’m worried about the chemicals in the Polypropylene ones. I recently purchased a trial one on Etsy and it is great. I think you mentioned you found your runner on Craigslist? It’s a beauty. Thank you Andrea! The polypropylene rugs also just don’t last— rugs can really get worn with a lot of use. I’m so glad you tried one out from Etsy! Great article Rachel! Since seeing your post, I’m considering one of these for my master bathroom, in front of my long vanity. I’ll send a pic if I do! So glad it was a helpful find for you Cindie!